Burning fossil fuels such as coal for electricity production, and gas for water heating both release large amounts of CO2 into the atmosphere, thus contributing to this environmentally harmful phenomenon. By using renewable energy sources such a Solar Thermal, Solar PV, Wind, Hydro and Geothermal, reliance on fossil fuels can be minimised, thus directly reducing CO2 emissions. There has been a great deal of information in the media over the past few years about global warming and the role of CO2 emissions. 2003 saw extreme weather conditions and a heat-wave throughout Europe, clear evidence of the realism of this problem, commonly referred to as the "green house effect" . On average for every 1kWh of energy produced by a coal power station, 1kg (2.2pound) of CO2 is produced. Burning natural gas for electricity production or water heating produces about 450grams of CO2 for every kWh of energy produced. At today's prices, a typical residential solar water heater have an operating life in excess of 20 years. For all intents and purposes, maintenance and operating costs are minimal. In the average household, water heating accounts for around 30% of CO2 emissions. By installing a solar water heater, which can provide between 50-70% of your hot water heating energy needs, you can reduce your total CO2 emissions by more than 20%. Solar water heating reduces the amount of natural gas extracted, transported and burned to heat water in your home. Solar energy increases the diversity of power and adds stability to a fossil fuel-favored energy structure, while reducing greenhouse gas emissions, including nitrous oxides and carbon dioxide, while saving money. Using optical lenses and mirrors to concentrate the sunlight onto a very small, highly efficient CPV solar cell. 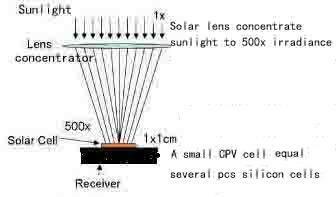 For example, under 500-sun concentration, 1 cm2 of CPV solar cell area produces the same electricity as 500 cm2 normal irradiance without concentration. This is particularly significant when considering the inherent efficiency advantage of the Multi-Junction technology over Silicon solar cells. The use of concentration, therefore, allows substitution of cost-effective materials such as lenses and mirrors for the more costly semiconductor PV cell material. Solar energy is part of the solution and is a key to our long-term energy supply.